The Sacred Meal is a book in the sacred practice series put out by Thomas Nelson. It is meant to explain Communion as a practice. I honestly cannot see where it did that much at all. It was like listening to a old woman ramble on and throwing in the occasional comment about communion. I was bored by poor writing. I was shocked by the talk of how the three Abrahamic faiths are so intertwined. It would be hard for a Bible believing Christian not to be put off by her comparing her spiritual experience to that of a woman in a Hindu ashram. There were several pages of her experience in full body prayer with Muslims as though we pray to the same God. I am not a deeply critical person. I generally get something good out of every book I read. In the hundreds of reviews I have done, I believe I have given a poor report on one. I now add this to that count. I cannot recommend this book. In fact, I ask you not to read it. 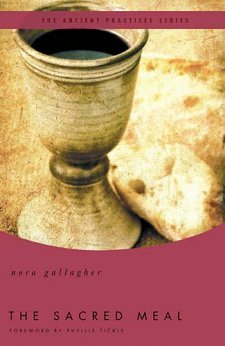 The intermingling of faiths is confusing and it says very little of the beautiful gift of communion. This book was provided by Thomas Nelson for review.